Cubesats are currently the standard small satellite, but some spacecraft designers are pushing their creations ever smaller. And that tipping point may not be all that far away, with engineers having already flown tiny satellites that stretch just 1.3 inches (3.5 centimeters) across. 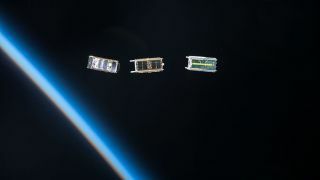 With these tiny satellites come the potential opportunity to produce hordes of them, turning one large device into a host of smaller, cheaper ones. That's why space junk and satellites alike are tracked by radar in order to alert owners to potential collisions and avert those threats. But right now, those systems can't see objects smaller than about 4 inches (10 centimeters) — and that means tiny satellites could orbit undetected and hit other satellites without warning. "If we start to launch things that are smaller than the ability for the radars to pick them up, then we're going to have problems," Klupar said. "These little chips are getting down to that size where they may just barely be visible, and by their very nature since they act in swarms you're going to want to have lots of them up there." That means a lot of potential collisions — and while the tiny satellites would likely be working in swarms that could withstand some losses, the satellites they hit may not be so lucky.